Take a story based on the familiar mythology of the Four Horsemen of the Apocalypse, the lightning fast combat of combo action games, the item collecting of a dungeon-crawler, then give it the scope of a Zelda title, and you’ll have an idea of what to expect from THQ’s Darksiders franchise. Originality, it could be said, isn’t the series strong point. Still, despite the lifted inspiration, Darksiders II successfully combines those popular ideas and gameplay elements to form one of the best action-adventure titles you’ll play this year. 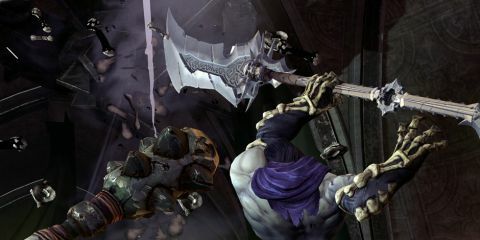 Darksiders II's story takes place shortly after War allegedly brought forth the apocalyptic End War in the first game. The second rider, Death, sets out on a quest to prove his brother's innocence. As the duel scythe-wielding masked horseman, you won't be spending as much time confined to Earth as War did. Death's mission takes him to multiple worlds plagued with a mysterious “Corruption,” including the giant Maker Uthane’s home world (the Scottish giant from the first Darksiders), the Land of the Dead, and the realms of angels and demons. Each area is a wide-open world full of enemies and dungeons to explore. And there sure are a lot of dungeons. If you aren't chatting with the NPCs in the hub towns or riding Death’s now instantly accessible horse, Despair, through wide-open areas, you'll be traversing dungeons. Of course, getting to the main dungeons is often a challenge itself, if only because you’ll want to take part in Darksiders II’s many distractions. You’ll travel across the massive worlds and be bombarded by sub-quests, collectibles, and mini-dungeons along the way to major plot points. Treasure chests are also sprinkled across the landscape, enticing you to complete short puzzles to get their rewarding contents. These include various weapon drops, armor and gold to use at merchant shops. Loot has been introduced in Darksiders II, which adds a new level of addictive item hording for the completionists out there. Not only will you be hunting for various collectibles, there are hundreds of rare weapons and armor you can get your hands on and some you can customize. Grabbing new gear can give Death bonuses to his magic usage, as well as increased health, upped defense, higher damage. It will also allow him to inflict special elemental damage like fire or ice. So, taking the time to climb a random castle off the beaten path ends up being extremely beneficial and rewarding. Finding your way is generally easy with the help of Death’s crow companion, Dust. Clicking down on the left stick points Dust to areas of interest. Outdoors he might direct you to a treasure chest, and in dungeons he points to the proper room you should explore to move on. Sadly, it’s disappointing to see the snarky comments and advice of Mark Hamill’s Watcher companion from the first game replaced with a crow and on-screen tutorial text. Death does interact with other characters often and some of them even follow him around from time to time, but the dynamic of having a true companion is sorely missed. Once you do venture into the major dungeons, the gameplay is a mix of combining your abilities to solve challenging puzzles, navigating platforming sections, and engaging in combo-heavy combat with the sequel’s more varied roster of enemies. Each dungeon keeps an excellent balance between those major elements and continuously keeps them alternating and flowing so that you never feel bogged down. The gameplay is always changing. One minute you’re fighting a horde of skeletons, the next you’re suspended hundreds of feet in the air, and the next you’re scratching your head about how to open a gate. Description Take control of the second horseman of the Apocalypse, Death, and travel through the Nether Realms to prove your brother War's innocence in THQ's Darksiders sequel.